Ed and I were the only two to camp Friday and Saturday nights. We spent Friday evening setting up camp and catching up on events since seeing each other at the last ED4 monthly meeting. Saturday morning others started arriving around 9:00 am. The first being a couple of aquatics of Ed’s from Modesto. Nik and Tom along with his two sons. They were members of a club named Rockeaters out of Modesto. At 10:00 am all had arrived and we had a run meeting with introductions. Tom and Nik were at their home turf and were happy to volunteer to lead the group around the park. Tom led the group of 8 rigs to the west side of the park. 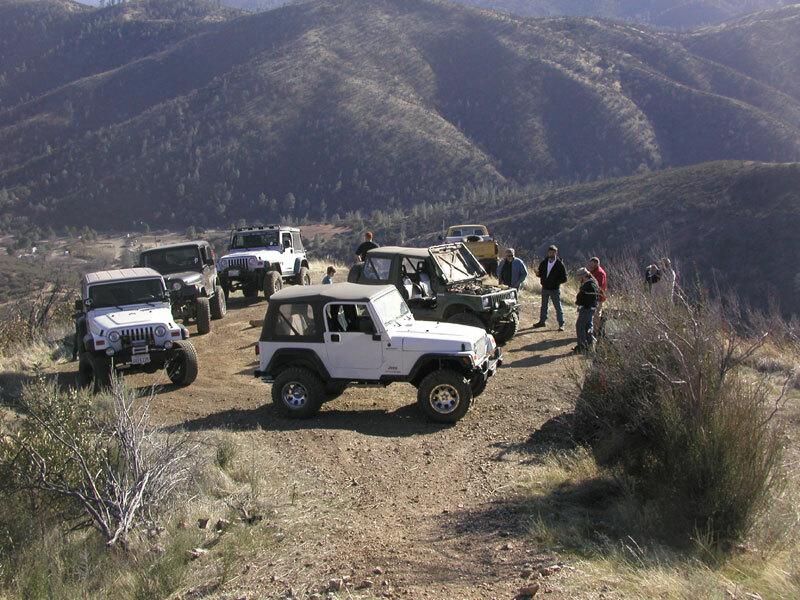 We encountered a lot of hills with some off chamber stuff, some creek crossings, and a little rock crawling. The park’s trails are mostly single lane routes that are bi-directional. Watching for oncoming traffic is a must and we mostly encounter motocross bikes. Some of the trails come to a dead-end and turning around 8 rigs took some coordinating at times. After a couple hours out on the trails we headed back to base camp for lunch. Waiting for us was Jim O’Leary with a friend who joined us for lunch. Lunchtime passed with more getting to know some of the new faces. After lunch we continued exploring more of the park. We made our way up a very steep section of the park that eventually got us to the top of one of the hills that had a fantastic view down to base camp. 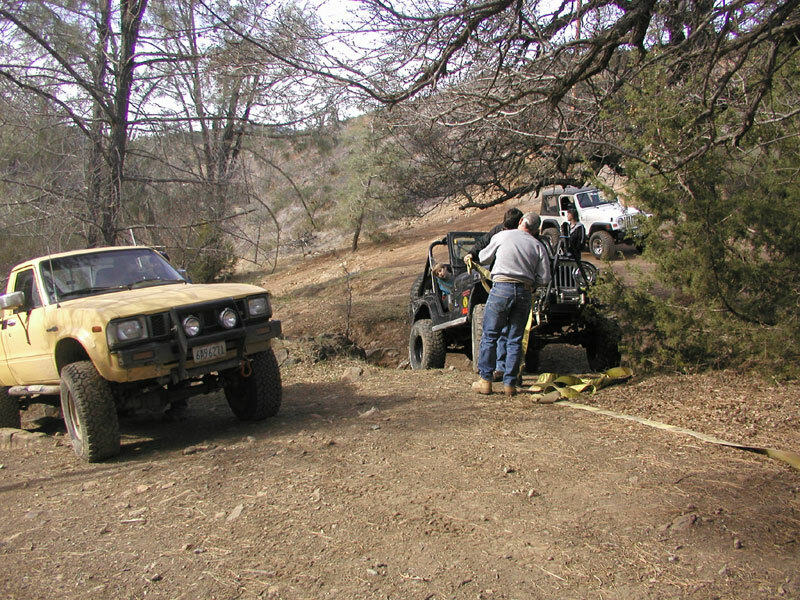 During this climb up the hill, Nik’s rigs started to overheat. After letting it cool down and adding some water to the radiator, it was decided we would make our way back down to base camp and Nik would leave his rig there. Getting down was uneventful and we made it down in no time. Nik joined up with Tom and his two sons in his CJ-5. The time was getting to be late afternoon and felt we had another hour of wheeling left in the day. This last section of the park was the best of the day. After going through the ORV gate we proceeded to turn left and go up a very steep bank. It should have been a clue what was to come. The trail continued to climb up the hill with gradual climbs. Then we came to one section that had a very steep climb. Ed was the guy to take the climb first. After watching him slowly making his way up and when we lost site of him at the top, we heard the “all clear, come on up” over the CB. All of us made it up with no issues. Once on top there was just enough room for all the rigs. The next decision the group needed to make was whether to continue down (we were basically on the ridge of the hill), or U-turn and go back down the hill we just climbed. We decided to continue moving on. Moving forward got us to a very steep downward section. At the base of this section, we heard a voice come over the CB asking, “is that you Ed, on the trail?”. It was Dennis and Ava who saw us on the trail from the main road to the park. They recognized Ed’s yellow Toyota. Ed responded with a yes and told Dennis that we would be making our way back to camp. At this point we decide we should turn around and start making our way back to camp. The only issue coming back came when I caught my front diff on a deep rut. With Ed’s help, picking a different line, and with lockers on front and rear, the climb out of this tough spot was done. When we got back to camp, most of the guys needed to start making it back home. We said our good-byes to most of the group. It was now about 4:30 pm, and all had left, with the exception of Richard Beard, Ed, and myself. Richard was just to pull out to head home when over the CB came a call “ED4 come in”. Richard and I looked at each other with a look of “who could that be?”, as Richard repliedGÇªentering the campground was Darell and Kathy. It was a nice surprise to see them. They had made their way over to spend a few hours with the group. Richard stayed a little longer to socialize with them before heading back to the bay area. That evening we had dinner and enjoyed talking about the day’s adventures. Darell and Kathy started back to the bay area at 7:30pm. Sunday morning was clear with some wind. After a couple of hours getting ready to pull out of the campgrounds, it was 9:30am and time for Ed and I to say our good-byes. Frank Raines is a fun place to venture out to and camp. 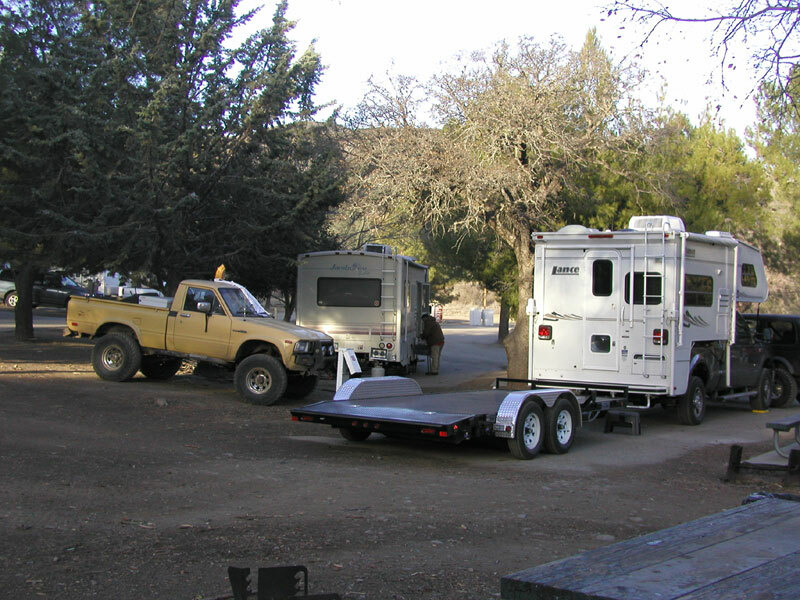 The trails are fun and the campgrounds are very well kept. Thanks to Ed for pulling this outing together.